WASHINGTON (CNS) — Cardinal Blase J. Cupich of Chicago and Archbishop Jose H. Gomez of Los Angeles will be among dozens of U.S. church leaders convening in June to address the troublesome polarization that marks church and political life and develop steps to work toward achieving the common good. The June 4-6 gathering at Georgetown University, “Though Many, One: Overcoming Polarization Through Catholic Social Thought,” is meant to be a starting point to bring about Pope Francis’ vision of the church responding to human hurts and social challenges by living out the joy of the Gospel, organizers said. The two prelates, at times perceived as representing “liberal” (Cardinal Cupich) and “conservative” (Archbishop Gomez) perspectives in the American Catholic Church, will be part of an emerging dialogue that planners hope will build stronger relationships and overcome long-standing divides. John Carr, director of the Initiative on Catholic Social Thought at Georgetown University, which is convening the gathering with other church organizations, echoed Daniels’ concern. “This is an attempt in a more focused and strategic way to look at how this unnecessary and unhelpful polarization reduces our ability (as Catholics) to make a difference in a really divided country,” Carr said. “We’re not going to debate economic issues or this controversy or that controversy. We’re going to explore the causes, the costs and how to overcome polarization which undermines (the church’s) public witness,” he told Catholic News Service. “The beauty of Catholic social teaching is it connects things that are not connected in politics-as-usual and we want to help make those connections,” he added. Participants will include on-the-ground Catholic leaders, including emerging leaders, from diverse backgrounds in response to appeals by Pope Francis for the church to be more loving and caring in the world, Daniels said. “We’re trying to respond to Pope Francis’ reminder that the church is a field hospital and to work in the concrete and not the abstract and work across ideological and political and economic lines,” she explained. The meeting is expected to draw up to 80 people from across the spectrum of church ministries, including pro-life, religious freedom, education, social justice and grass-roots organizations. In addition to Cardinal Cupich and Archbishop Gomez, a public session will feature Helen Alvare, professor of law at George Mason University’s Antonin Scalia Law School, and Sister Teresa Maya, a member of the Sisters of Charity of the Incarnate Word from San Antonio, who is president of the Leadership Conference of Women Religious. Daniels and Carr stressed that the meeting is about building long-term relationships among the attendees in the hope that those links will lead to new bonds of understanding and respect in local communities. The planners expressed concern that the divisiveness within the church and society has become more widely apparent with the growing influence of social media. They said such divisiveness leads to a wider perception that the church has no standing offer guidance on public issues. 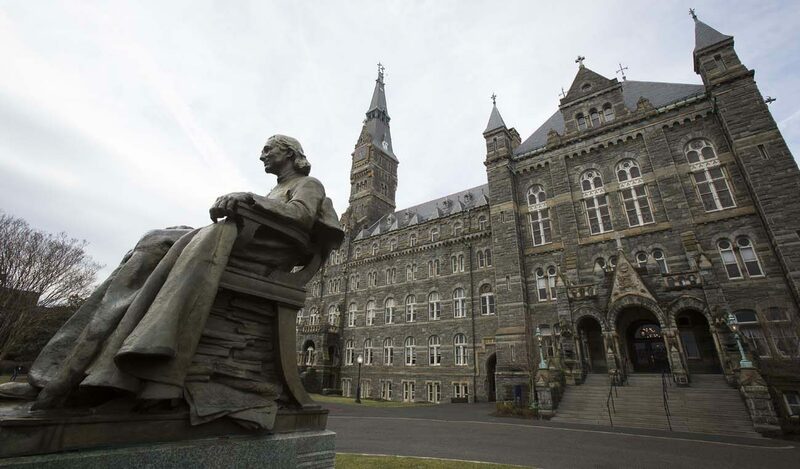 By convening church leaders in face-to-face discussions at Georgetown, discussions on behalf of the common good will move forward more rapidly, the planners said. Participants also will be asked to develop an action plan to follow up on when they return to their home offices, dioceses and parishes. The idea is for each participant to “address polarization in their spheres,” Daniels said. Details on the public session will be available later. Is Archbishop Chaput invited, or even attending? Most conservatives who comment on Archbishop Gomez do not view him as conservative. This event seems like a “progressive” smokescreen. This gathering appears to be a “top down” approach to achieving results eventually at the local (parish) level. Consider how many statements the USCCB has made over the years on a wide range of topics. More often than not, the phrase “Catholic Social Teaching” is invoked to bolster whatever position the USCCB happens to take at any given moment. The term has almost become a mantra. It seems like Catholic Social Teaching is a pinata full of theological concepts. The issues are so diverse that it is no surprise that consensus is rarely achieved at any level when attempting to address matters that require government to partially or fully address. As one example take the “individual mandate” that was part of Obama Care. Now some folks didn’t want the government forcing them to purchase health insurance or pay a penalty. There are many other issues where reasonable people will disagree on policy responses. President Trump recently deployed small numbers of National Guardsman to backstop the Customs and Border Patrol on the southern border. Earlier President’s did likewise. Yet the uproar by some over Trump’s action far exceeds the small contribution these few troops will make. To date I’ve only seen Pope Francis and perhaps the Mexican Bishop’s Conference address the need for enhanced evangelization in Central America countries to combat endemic corruption that is partially responsible for the desire to migrate to the US. Illegal drugs are another issue where Pope Francis has spoken out strongly. Then there is NAFTA, the US federal budget priorities, taxes, Planned Parenthood etc. and the list goes on and on. For those who lean toward socialism, take a look at the situation in Venezuela. Tariffs and foreign trade is another area. If China and some other Asian countries paid their workers more or had unions to support workers’ rights then their exports would cost more for US consumers and our trade deficit would decrease and our balance of payments improve. Unions are part of Catholic Social Teaching, but the Vatican has been busy cutting a deal with the Communist Party government in China to allow some type of joint naming of Bishops. If this seems terribly complicated it is because it is. And let’s not forget personal responsibility. When it comes to our personal final judgement we may not have to answer whether we voted for Hillary Clinton or Donald Trump.